"I am just trying to find a way to make pictures"
The communications director of the South Carolina Arts Commission left a comment on my blog this week...thanking me for mentioning the Elizabeth O'Neill Verner Awards (see this post) and letting me know that this year they are celebrating 40 years of the Verner Awards. For more than 40 years, the Art's Commission, through grants, education and other services has helped artists "find a way to make pictures." So that all citizens in this state can "enjoy and benefit from the arts." This prompted me to explore the Arts Commission's website...which lead me to the work of cartoonist Robert Ariail, who received the 2012 Individual Artist Award. While I do tire of how ubiquitous our State logo has become...I find Mr. Ariail's design for the State Farmer's Market novel and refreshing. 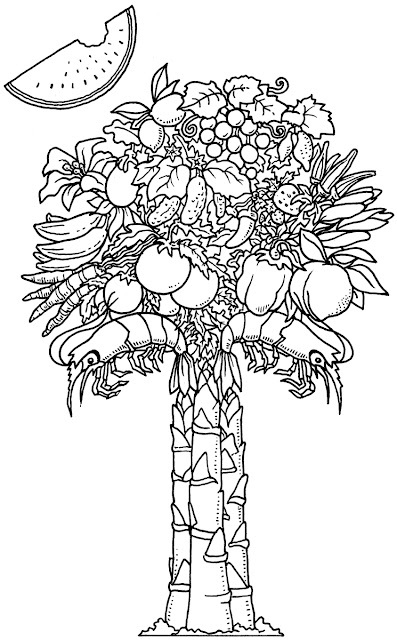 If you visit the Farmer's Market's site, you can even download and color your own version! Can't wait to do this with my girls...perhaps it will entice them into eating these foods as well. Watermelon, peaches and shrimp..."nothin' could be finer than a day in Carolina"